There were plenty of options, including specials and some non-grilled cheese options, but I went with something called The Lar. 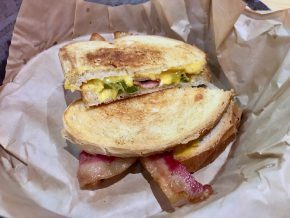 The Lar is what happens when you try to turn jalapeno poppers into a grilled cheese and throw bacon in for good measure. Seriously, it’s cheddar, cream cheese, jalapenos and bacon on white bread. You really can’t screw a sandwich like this up, and Melt It! did not. However, it was surprisingly light on the cream cheese. I know I’m used to bagels loaded up on the stuff with no other toppings, but this went beyond that. Fortunately there was cheddar for backup. A little bit more shmear would have gone a long way, but it was the slightest complaint. Melt It! did a solid job of changing up grilled cheese and one of my favorite appetizers so I left a happy unvegan.